Click here to enter to win a 12 pack of BAWLS Guarana and a copy of Fallout: Brotherhood of Steel for PlayStation®2 or X-Box. Play Magazine - "… you’ll be capping scumbags left and right in a fireworks display of flesh and blood…"
GameInformer - "From the very start it has a great old-school charm about it, and is easy to get sucked into"
New fun and addictive "Vault Dash" Minigame for you to play! Vault Dash - It's a race for your life as you navigate Cyrus, one of the heroes of Interplay's upcoming "Fallout: Brotherhood of Steel", past deadly toxic sludge and giant radioactive beasts. Use your bonus weapon to kill the little enemies, and your quick reflexes to avoid the big ones. Do you have what it takes to be a part of the "Brotherhood of Steel"? Fallout: Brotherhood of Steel © 2003 Interplay Entertainment Corp. All rights reserved. Fallout, Interplay, and the Interplay logo are trademarks of Interplay Entertainment Corp. Dolby, Pro Logic, and the double-D symbol are trademarks of Dolby Laboratories. The ratings icon is a trademark of the Interactive Digital Software Association. "PlayStation" and the "PS" Family logo are registered trademarks of Sony Computer Entertainment Inc. All rights reserved. All other trademarks and copyrights are properties of their respective owners. 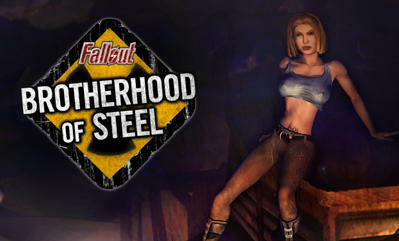 Fallout: Brotherhood of Steel © 2003 Interplay Entertainment Corp. All rights reserved. Fallout, Interplay, and the Interplay logo are trademarks of Interplay Entertainment Corp. Dolby and the double-D symbol are trademarks of Dolby Laboratories. The ratings icon is a trademark of the Interactive Digital Software Association. Microsoft, Xbox, and the Xbox logo are either registered trademarks or trademarks of Microsoft Corporation in the U.S. and/or other countries and are under license from Microsoft . All rights reserved. All other trademarks and copyrights are properties of their respective owners.